This is slipshod for a whole host of reasons. For instance, implementing hard borders with the EU will lead multinationals to shift a lot of their operations in the UK to the Continent. Moreover, even if the EU were to take a bigger GDP hit (debatable at best), it would be spread across a much larger economy and population, making the relative decline on an aggregate and per capita basis smaller. This post provides a more granular look at which regions are likely to suffer most as a result of Brexit. 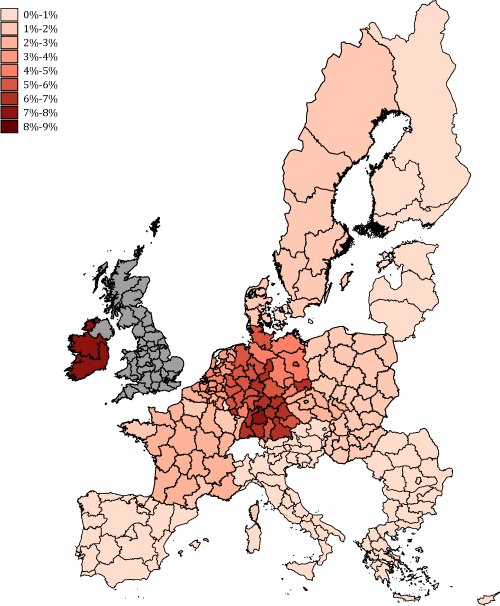 Analyses of the impact of various types of Brexit at the national level hide a lot of regional economic heterogeneity. This column deploys a new interregional dataset to quantify the shares of regional labour income that are exposed to the implications of Brexit for trade, taking into account the indirect effects of supply chain relations. The results show that much more is at stake for UK regions than for the rest of the EU, with the exception of Ireland. Over the past two years, several studies have addressed the question of the extent to which the UK and other EU countries will be affected by various types of Brexit (e.g. Ebell et al. 2016, Dhingra et al. 2016, Brakman et al. 2017). These studies adopted a range of methodologies, some of which rely on global input-output tables. The main advantage of global input-output tables is that they provide a natural link between trade and value added. In a world of global value chains, the value added by an economy cannot be deduced from gross trade balances. This is important, because if Brexit leads to higher trade barriers, the reductions in value added are not necessarily proportional to reductions in gross exports. We focus on the Brexit exposure of regional labor income, rather than of regional GDP. The main reason for this is that profits are not strongly tied to the region where economic activity takes place, since they are often ‘repatriated’ to company headquarters. In contrast, commuting between regions defined at NUTS2 level is limited, so labour income can be considered as more ‘sticky’. Currently, various varieties of Brexit scenarios are still on the table, in a broad range from a ‘cliff-edge’ Brexit to a Brexit in which the UK (or parts of it – i.e. Northern Ireland) would remain in the customs union and/or the Single Market. We do not estimate the regional labour income effects due to any of these scenarios. Instead, we estimate the shares of labour income that are ‘exposed to Brexit’. We arrive at these estimates by comparing actual labour income to labour income in a situation in which bilateral trade flows between all EU regions on the one hand, and all UK regions on the other, would be set to zero. This ‘hypothetical extraction’ of trade flows is done for both UK-EU trade in intermediate inputs and trade in final products. For UK regions, this amounts to computing the ‘regional labour income in exports to the EU’ following Los et al. (2016), which provides the required bilateral extension of Koopman et al. (2014). The approach is based on Leontief’s input-output model, which has a demand-driven nature. We derive our indicator of labour income exposed to Brexit as the difference between actual labour income and the hypothetical labour income. This compares the actual situation to the situation that would prevail if Brexit would have its maximum trade effects (zero trade crossing UK-EU borders) and substitution among products and among regions/countries-of-origin would not take place. Given that firms and consumers will of course react by substituting away from more expensive products, our indicator should not be seen as predictions of the actual effects of Brexit, but rather as the share of regional labour that is ‘at risk’ due to Brexit-related trade barriers. A major advantage of using this approach is that it takes the consequences of outsourcing and offshoring of stages of production (Timmer et al., 2013, Baldwin, 2016) explicitly into account. Labour income in the business services industry in Noord Holland (the Dutch region of Amsterdam) might be affected if it delivers part of its services to a manufacturer in South Holland (the Rotterdam region) who exports to the UK. An analysis based on only bilateral trade data would therefore be biased. The analysis is based on the most recent EUREGIO table, for 2010. Figure 1 presents the results for each of the NUTS2 regions in the UK. The lowest level of labour income exposure to Brexit is just below 8%, in the Highlands and Islands (Northern Scotland). Other regions with low exposure levels include Northeastern Scotland, Merseyside and both Inner and Outer London (slightly above 9%). This latter result might be seen as remarkable, in view of the popular claim by the Leave campaign in the run-up to the referendum that EU membership mainly benefitted the ‘metropolitan elite’ in the City. There are two reasons why London appears less exposed to Brexit than the average British region. First and foremost, the London economy is very large, as a consequence of which it produces a large part of its output for local use. Second, the important financial services industry caters to many British clients elsewhere in the UK and a substantial part of its exports have non-EU countries as their destination. 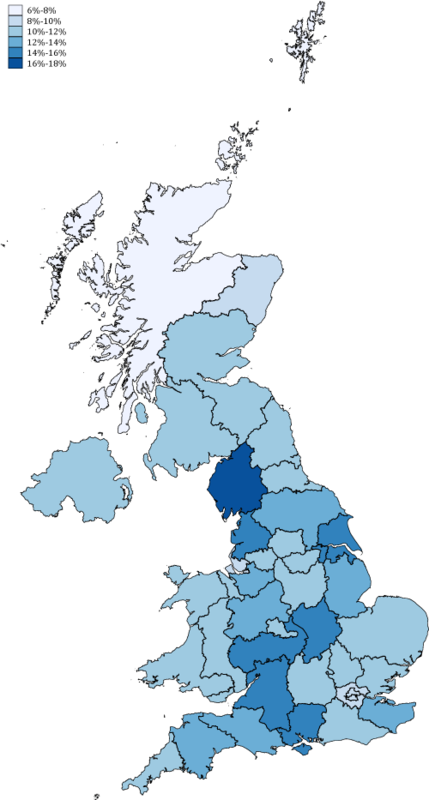 The highest labour income exposure level amounts to almost 17% (in Cumbria). Other regions with high levels of exposure include Lancashire, Leicestershire and East Riding/North Lincolnshire, which are located in the old British industrial heartland. In these regions, the exposure levels are 14-15%. Figure 2 focuses on the exposure levels of non-UK regions. Not surprisingly, Irish regions might well suffer the most. According to our indicator, their exposure levels (about 7.5%) are comparable to the least vulnerable regions in the UK. For the vast majority of other EU regions, the risks are much smaller. In the regions in Southern Germany with a lot of high-tech manufacturing, exposure levels amount to 6-7%. For other German regions and Belgium and the Netherlands, the risks are about half this magnitude, while in the remainder of European regions the exposure levels are even lower. Differences among regions are the outcome of the interplay of two broad factors. First, some regions have higher export intensities to the other side of the Brexit divide (direct and/or indirect, via participation in supply chains spanning multiple regions) in virtually all sectors. Second, some regions are highly exposed to Brexit because they have specialised in producing tradable products, such as manufactures. Kent, in the extreme Southeast of the UK, is ranked 9th among the UK regions with regard to its overall exposure. Its manufacturing industry, however, is extremely vulnerable to Brexit due to Kent’s port of Dover – we estimate that almost 44% of its labour income in manufacturing is at risk. In Cumbria, a smaller proportion of manufacturing labour income is exposed (38%), but as much as 30% of its labour income is generated in this sector (as opposed to 17% in Kent). We focus on the extent to which regional labour income is exposed to trade barriers due to Brexit, taking configurations of supply chains into account. The estimated effects may be seen as an upper bound of the actual effects, yet the fact that we do not consider the income that might be lost due to relocation decisions, for example by multinationals, may on the other hand render our estimates more conservative. Bearing this in mind, two results stand out. First, labour income in London will most probably be hit less than in many regions in the Western and Northern parts of England. These regions are already poorer and have higher unemployment levels than the UK average (McCann 2016), which means that economic inequality among UK regions is likely to increase. Second, labour income in regions in the UK are much more exposed to Brexit than labour income anywhere else in the EU, despite marked differences across EU27 regions. Hence, the stakes in the Brexit negotiations are much higher for the UK than for the EU27, despite the fact that the EU27 is a net exporter to the UK. The nature of the recent deal that concluded the first stage of UK-EU negotiations seems to reflect this finding. This entry was posted in Brexit, Europe, Globalization, Income disparity, UK on December 21, 2017 by Yves Smith. While the analysis claims to take “configurations of supply chains into account”, it seems to assume that the supply chains will stay the same. IMO, that is not going to happen. If a manufacturer moves a factory from Kent to Ireland (or CEE area), it will clearly have some impact on the supply chain, but possibly much smaller than if it stayed in Kent. Similarly, if the same manufacturer becomes more expensive (not only in money, but hassle in general), there is a good likelyhood that an EU supplier might substitute it. I expect that we’ll see the supply chains being reworked from early next year, with likely impact on the UK businesses from about mid next year. If I had enough money and time, I analyse the highest-value supply chains in the UK (that are part of the EU overall supply chain), and buy EU competitors (if there are any) with a view of taking that business from the UK. I mentioned this before, but I’m just about old enough to remember that in Ireland pre-customs Union there were a couple of car plants in Dublin and Cork which essentially put together cars from kits manufactured elsewhere to minimise customs duties. The complexity of manufacturing chains these days are now an order of magnitude more complex due to assumptions that customs duties don’t matter so much anymore. The feeling I have (based mostly on conversations I’ve had with people who work in the field) is that companies will respond by simplifying their supply chains on either side of the UK border. In other words, they might keep a car manufacturing plant in the UK, but they will cut out the sourcing of components locally in order to minimise supplychain risk. So UK car manufacturing will become more like the old Irish car plants I remember – final assembly plants with little functional connection to their local economy. I should state as a disclaimer that this isn’t my expert area, people with more insider knowledge may know more. My concern is mostly for SMEs that are in the supply chain of some EU manufacturers. As you say, I expect that (say) some carmaking capacity will stay in the UK, to assemble the final product. But if I was an SME that manufactures parts of the DSG gearbox for VW (a random shot, I don’t claim such an SME exists in the UK), I’d be worried. In other words, BMW sees Oxford as an assembly plant. I read that as meaning that BMW has kept its options open, has spent next to nothing so far but has a Plan B to move production to the Netherlands – an option that would presumably cut off much of the existing UK-based supply chain if that’s how things develop. Apparently, Peugeot SA is considering the same for its UK plants, which now include Vauxhall (Opel). I should have added that BMW could make a lot money using that land for real estate development, mainly real estate and perhaps some commercial linked to the university and motor racing teams based north of the city. Richard North had a comment on his blog a bit ago about the Brexit effect on motor racing. There are a lot of suppliers and teams located in the Midlands, and having customs delays between them and their customers in the EU may cause problems I used to subscribe to a British racing magazine (RaceCar) just to see all the amazing adverts of the various specialty suppliers located there. Need custom carbon fiber assemblies, or specialty gearbox components? It’s all right there. I expect Northern Italy (Dallarra race cars for example) are aching to pick up some business. I have heard from a former colleague now contracting at VW HQ in Milton Keynes and a relationship manager at the firm you and I know that UK firms are beginning to roll off German supply chains, so well ahead of Brexit. The reasons are the uncertainty and the legal risk from EU rules on origin. I have also heard from two techies. In one case, one of the employer’s contracts in the City was not renewed, so he was laid off in the summer. In the other case, contracts for the techie’s firm have started drying up, so the partners have put the firm on sale and he plans to retire earlier than planned / expected. We focus on the extent to which regional labour income is exposed to trade barriers due to Brexit, taking configurations of supply chains into account. The estimated effects may be seen as an upper bound of the actual effects, yet the fact that we do not consider the income that might be lost due to relocation decisions, for example by multinationals, may on the other hand render our estimates more conservative. I think this is key – I would have thought that the biggest danger by far for the UK economy is a wave of relocation decisions as companies seek to minimise risk to supply chains. Another issue which would exacerbate the impacts outlined above is in agriculture subsidies. UK agriculture is heavily underwritten by EU subsidies (not just agricultural subsidies, regional development grants too). Its very hard to see a British government under financial stress maintaining farm supports to weaker regions to anything like the extent that exist right now. I think this will seriously exacerbate the impact on more rural areas of northern England, Wales Scotland and NI. On relocation I absolutely agree – but as I write above, I also suspect there will be quite a bit of substitution or price cutting, which will affect especially SMEs. On agri – May promised to keep the subsidies up to IIRC 2020, not sure whether beyond (it might have been tied to the end of parliament or something like that). That said, I believe that quite a few farmers, of who more than a few voted leave are now having second thoughts because of subsidies. And when Gove and co says “just do as New Zealand did”, I cringe. I love NZ, spent a lot of time there, and have the passport. But I also saw what extensive farming (of which NZ is a champion) does to the environment, especially waterways – basically, outside national parks the water is more often than not danger to even bathe in, not to mention drink. I think, yesterday, Gove pledged to pay the subsidies beyond 2022. Much of the subsidies go to big and often aristocratic landowners, not small farmers, and for odd things, too. I know two women in Buckinghamshire, one my former manager, who get EU money for setting aside their fields. Neither has any intention of growing food or grazing livestock. The fields are for their horses to graze and gallop, but the pair can scam the system. The in laws of Ian Duncan Smith farm about thousand acres in mid-Buckinghamshire. They also own the village pub. Much of the subsidies go to big and often aristocratic landowners, not small farmers, and for odd things, too. I know two women in Buckinghamshire, one my former manager, who get EU money for setting aside their fields. Neither has any intention of growing food or grazing livestock. That’s pretty standard. That’s also how farm subsidies work in the US. Payments are usually doled out on a per-acreage basis, so there is a built-in bias in favor of the big fish. And the whole purpose of farm subsidies is to keep prices up by restricting supply, so that means paying people not to grow certain crops. I think UK agriculture is in a real bind. The problem is that decades of price distortions have meant little relationship between what is grown and what people want, or need to eat. To make it worse, much processing capacity for UK agriculture is in the EU – for example, Ireland imports a lot of UK milk for processing, so just producing more products for domestic use is not a real alternative unless there is a rapid build up in domestic production capacity. Then add to the problem of fruit and veg growing being hit very hard by a shortage of foreign agriculture workers… and you are looking at a very difficult situation. Add this to the fact that any trade deal with the US, South America and Australia/Nz will mean huge pressure to open the door to cheap imports of beef, dairy and grains. IIRC, a few weeks back I read that this fall UK farmers had about 30-40% staff shortages as the usual EU farm labourers didn’t turn up. And this is when they still could have turned up. I can recognise these figures from Buckinghamshire, Oxfordshire and the Fens. France 2 reported similar from Cornwall a fortnight or so ago, part of the more user friendly coverage of Brexit from the continent and one that puts the UK media to shame. It’s not just farming, but the fish finger factories around Hull and the north east of Scotland. Many of the staff are from eastern Europe. In the case of arable farms in Buckinghamshire, workers were hurriedly imported from Sri Lanka in late summer, but it was too little, too late. PK, why would a sovereign government running a fiat currency system be under financial stress? It might be under resource stress, but that is different. Because the UK is a very open economy that needs imports for food and energy and to keep its industry going. And its only strong export is services, which will be destroyed by Brexit. And a dropping Sterling means its harder and harder to buy all those products. The problem is that the Tories are not open to ideas that might help cushion the blow of Brexit, like MMT or nationalization. Another complication for UK agriculture is that many big landowners farm parts of their estates “in hand” and have tenant farmers for the other parts. There is a trend to farm all or as much as possible “in hand” and automate, often a pooling of management and resources. Therefore, one could see a spike in rural unemployment and depopulation. One could also see more absentee landlords operating by way of letter boxes in “tax efficient” jurisdictions and agribiz giants as farmers sell up and farms consolidate. Uh, is there some date on which something will happen? I enjoy reading about this and the UK and Euro politics and such. But Brexit happened like 80 years ago and UK still hasn’t admitted it happened. I’d like to see some actual dates by year, month, and day about when things need to happen. Otherwise I’ll just view Brexit as some interminably bad sitcom or drama TV series.